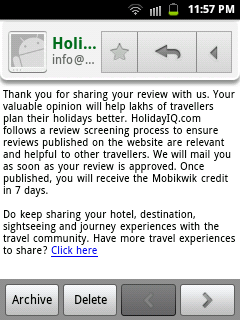 Write a Hotel reviews at Holiday iq and get 500 Rs in your mobikwik wallet,Each user can avail this offer only for one time,To avail this offer just visit the target page link and select from amongst the respective options,signup and submit your review, you will get Free 500 Rs in your Mobikwik wallet offer for successfully approved review. 2) Select “Hotel” and Find any Hotel from any Location. 4) Now Click on “Submit” button. 5) Now They will ask you to Sign up with Facebook or Google+ to Submit your review. 6) Now Login with Facebook account and Allow permission App. 7) Once your review is submit Successfully you will get confirm email from Holiday IQ.. Now wait Once your review is published successfully, you will get your Mobikwik wallet balance within 7 working days. 8) Earn Rs. 50 in your Mobikwik wallet for every review on Hotels before 31st August 2015. • Earn Rs. 50 in your Mobikwik wallet for every review on Hotels before 31st August 2015. • The reward of Rs.50 will be credited to members Mobikwik Wallet within 7 days of getting a confirmation from Holiday IQ after publishing a hotel review. • Maximum of Rs. 500 would be credited in the above mentioned time periods for 10 (and above) reviews that get published on HolidayIQ. • The Offer is only open on Hotel reviews (as applicable) submitted during the time period mentioned in the offer above. • Email to sign-up at HolidayIQ should be same which was used at the time of sign- up at Mobikwik. • If a Hotel review is written before creating a Mobikwik wallet, the user will not be eligible for cashback.